Driving means you have less time to look around and definitely reduces your appreciation of the world about you. All I could see on the journey south from Market Harborough to Maidstone was the tailgate of trucks on the A14, M11, M25, M2, etc. What was visible of the countryside was that great monoculture of the cereal growing mega-farms. Some people call this a prairie, but that seems a little bit romantic for me. Whatever wildlife exists in these parts, must have to struggle for shelter, for food and contact with its own species to reproduce successfully. It suits a motorway backdrop, but it contributes to the monotony that they must have in mind when they warn that 'Tiredness Kills, Take A Break'. I wished there was a rest from the desert of modern agribusiness. Today was not supposed to be as long a journey as the first day. I divided up the trip to make it easier and less of an ordeal, but there were so many points where we slowed to 50mph that after an hour and a half we were still way off reaching the M25 around London. We stopped at a services where there is a drive through Starbucks. Now, I'm all for multi-tasking, but the idea of juggling driving and scaldingly hot coffee while struggling with your small change on a motorway slip road is something you'd think those health and safety types might have put before the worlds biggest coffee sellers and tax avoiders. We have taken to mixing our coffee drinking with the crossword and Sudoku. That's about as exciting as we want it to be. And it means you can avoid the contemplation of your surroundings, these great aircraft hangers, where you are encouraged to top up on your shopping addiction. In 1976 we never made it to the Lakes. Coming out of our Manchester hotel and standing beside the road, we had no luck thumbing a lift. We walked a little way to a roundabout. There, after a long stretch of wasted travelling time, we flagged down a truck, only to be told that it was not going north, but west. I cannot remember if we hesitated or not, but it was surely only a few seconds later that the driver's companion was taking us around the back, to clamber up inside. There, as they closed the door behind, with warnings to hold on tight, we could see that we were in the back of an animal transporter. A recently used one at that. At the first roundabout we were flung first to one side, then the other. As the truck began to gather speed, the wind coming through the slatted sides started a whirlwind of straw and animal dung, flying up to cover us. When it became clear that the driver and his wife in the sealed cab could not hear our calls for them to slow down, we attempted to get away from the storm by pushing and pulling each other up onto a ledge where equipment was stored. It was much safer and healthier for us up there and we survived the rest of the journey by holding onto the walls and ourselves, at every bend. Today, the only mess flying around inside our car was the stuff we left in it since setting off. We make it a point to have the car serviced before a long trip. That way you at least start with a valetted interior. It is incredible how much mess two people can create in one day of driving. We left the service station after the usual search for the exit, where the circuit around the car park seems to yield very few clues, but lots of chances to be crushed under a truck that is randomly crossing the unmarked lanes. By the time you get out onto the road, the benefits of a stopover have been ruined by the stresses of finding the way out of there. It was on the acceleration lane that I discovered how low our fuel gauge had fallen. Either fuel evaporates in hot car parks, or slow driving is not as fuel efficient as VW claims for this car. It must be the former, because they can thoroughly verify the the fuel consumption of their cars, can they not? Anyhow, this did not worry us unduly, as there must be lots of service stations around the M11, M25. Not as many as you'd think, it turned out. As the needle dipped well into the red, the tension in the car headed into its own danger zone. It was not helped by the impression that the last few litres in the tank are used up exponentially. We had no need of warning lights and displays to tell us how close we were to a breakdown in the middle of roadworks. It is these same roadworks that were partially to blame for us not getting off at the next services. We failed to appreciate that the lane going off between lines of cones, is for both the road junction and the fuel stop. You keep telling yourself that 'empty' doesn't mean empty, that manufacturers always put in a tiny space at the bottom of the tank. It's probably called the idiot reserve, or moron pot, something with a technical term like that. Of course we eventually made the turn off to find a petrol station and I immediately felt the worry had been entirely overdone. “We were never really going to run out of petrol” I told Christina. She didn't answer, but her look managed to convey “Yeah, right”, without the need for actual words. Perhaps it is the release of tension, but all around the world looked different. No longer a uniform pattern of massive fields stretching away to the horizon, there are actual tree covered hills in this part of Kent and small green fields behind rich hedges. Even the air feels easier to breathe. 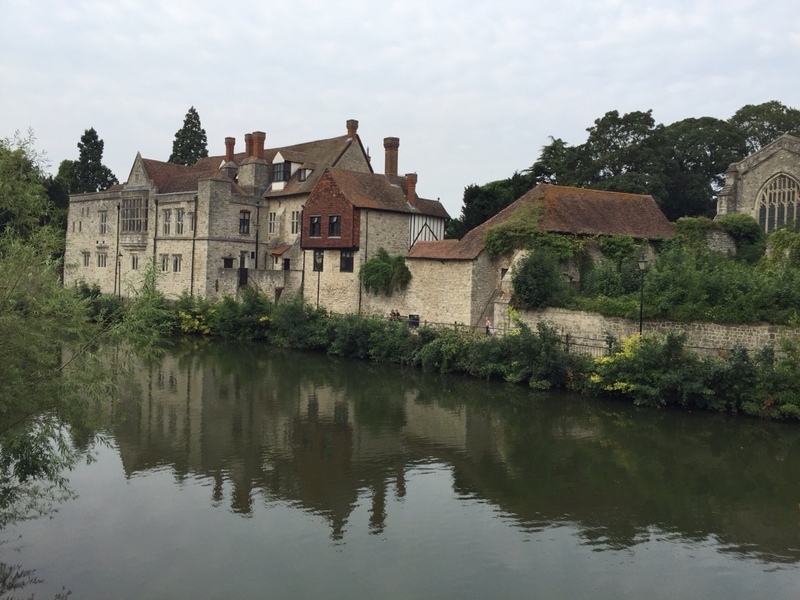 We had hoped to make it to Maidstone early enough to go on and explore a part of the world we have neither of us, visited for years. But once we poured ourselves into the hotel room and shut the door, we were not going to get out and face the traffic on the one-way system. So leaving Christina in the room overlooking the Medway river, I went out for a walk around town. On our honeymoon, we had no idea where we were when the truck carrying us finally stopped and the doors at the rear opened. It was like being released from a kidnapping. We stumbled out into the daylight of North Wales. Only much later did we learn this was near Conwy, with family and possible refuge only a few miles away. Our lack of planning showed up here in full. We had very little money to spend on ourselves. All we had was left over from a summer spent working in Cornwall. I had proposed to Christina in a shed we were living in and the day after we walked out of our jobs in a cafe on the beach. Two weeks later, we were married and standing beside a road, picking straw and animal dung out of our hair and clothing. We had, as I said, no idea where we were, and only a two person nylon tent and a single camping stove for accommodation and survival. Standing beside a road, deserted in both directions. Still, it was sunny, in the longest drought in living memory. We chose the direction at random and began to walk, hopefully in the direction of a village or campsite even. A long while later, with nothing vaguely promising in sight, we came upon a group of lads. We immediately took them as saviours, for on questioning, they turned out to be Boy Scouts. What's more they were camping nearby and offered to lead us to the place. Gladly did we follow them. They turned off the road, down a track, until we came to a railway line. Instead of crossing, they began to walk along it. We followed, reassured by their apparent local knowledge of train times. It is not easy walking on railway sleepers and ballast and it seemed like a long trek to this campsite. When we turned off the track and arrived at a clearing beside the river, we were so relieved at being out of any danger, that it was a few seconds before we began to appreciate the situation. In 'Swallows and Amazons' it is fine to set up a camp on an island. In real life, there are questions like, what to do about water, how to make a toilet, what are we going to eat and what on earth were we thinking of pitching our tent two metres away from a bunch of adolescent boys for the night? There were no satisfactory answers to any of those questions, so we ate our last snacks from the day before outside the tent that was not big enough to sit upright inside. All other questions were resolved by our reluctance to risk the walk back along the railway track and the falling light. We had no choice but to crawl inside our tent and try and get some sleep. Amazingly, we did almost immediately. The river outside Travelodge was a bit canalised, but climbing up onto one of the bridges, I saw what looked like old buildings and something green and park like in the distance. Soon, I was on the riverside walk and the old buildings turned out to be the old church and college, large parts of which are fourteenth century in origin. It was very good to see not only the riverside, but the presence of people making use of the shade to escape the sunshine. There is an amphitheatre and a large rose garden beside the path and I began to settle in for a fair walk in attractive surroundings. This turned out to be a delusion, as almost immediately I came across a fence erected across the path, marking the boundary of a row of houses along the river. The path here turned abruptly uphill and I followed it, hoping that this was a minor obstacle that could be circumvented. However, at the top I came to College Avenue, which advertised itself as a private road, not open to, nor welcoming of vehicles and pedestrians. Reluctantly, I turned away and back along a road towards the town centre and the river. Returning to a modern footbridge I'd passed earlier, this time I crossed over. There I found the leisure centre and the Medway Footpath. 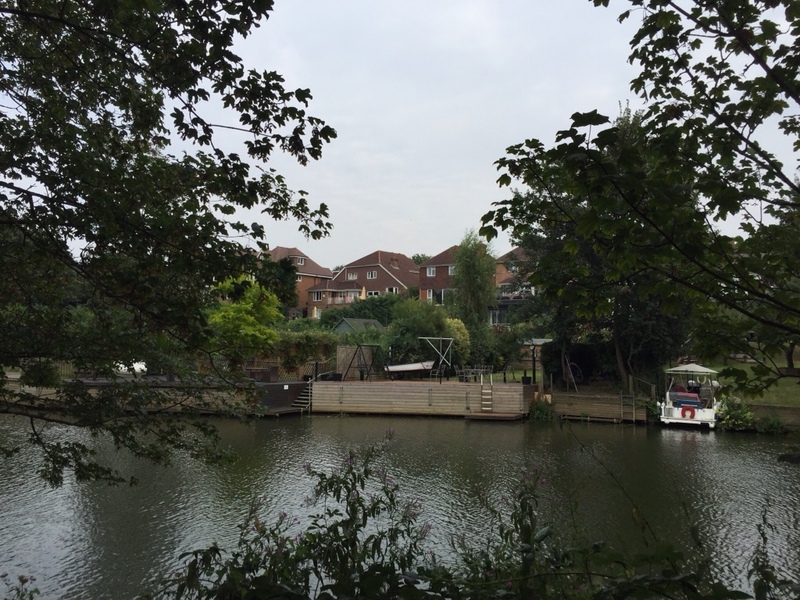 Casually strolling along with other locals, I found myself being saddened and then angry at the appropriation of the riverside by the large houses on the opposite bank. It wasn't just the size and grandeur of them, but the way in which many had constructed walls and fences between them and the very thing their privilege gave them access to. Or maybe the walls were there to prevent anyone using the river from mooring at the foot of their property. The satisfaction and enjoyment of the walk along this side of the river was never going to let this feeling spoil my walk and I soon found myself smiling at families strolling along with small children in tow and the sight of rows of fishermen hopefully casting into the sparkling waters beside us. Following an excursion across the railway and through an estate of terraced houses, trying to find an alternative route back into town, I retraced my steps along the river, eating wild blackberries and listening to a pair of fishermen talking about the joys of gambling as I passed. I didn't see more of the town beyond a few shops where I went to buy food for an evening meal, but it looked like it had more to offer a visitor and is not just a commuter town just off the route to Dover.